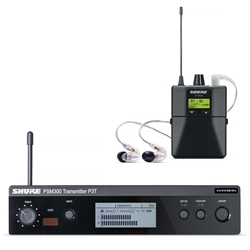 PSM300 Stereo Personal Monitor Systems deliver reliable wireless freedom to every corner of the stage. Patented Audio Reference Companding ensures the clearest sound, with ultra-low noise and no artifacts. The Shure P3TRA215CL features SE215 Sound Isolating™ Earphones, all-metal components with optional receiver rechargeability, and more advanced receiver controls.